Harold Ramsey, 93, of Cape Girardeau passed away Friday, August 29, 2014, at his home. He was born November 18, 1920, in Advance, Missouri, son of Maple and Tracy Simmers Ramsey. 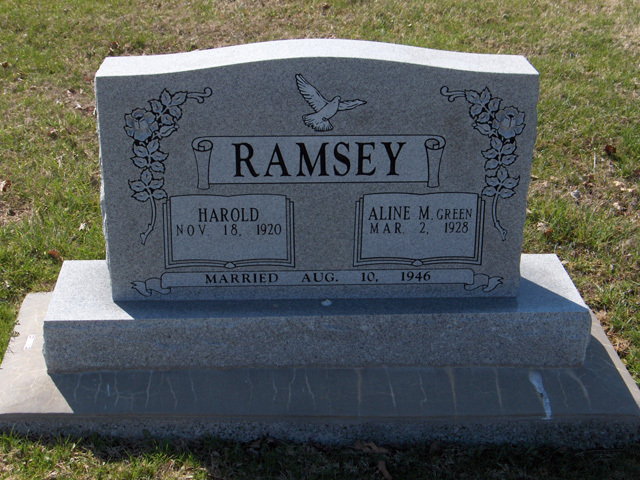 Harold and Aline Green were married Aug. 10, 1946, in Alton, Illinois. Harold had been a crew leader at a glass company in Alton. He had been a member and deacon at Kinder Church in Kinder, Missouri. Survivors include his wife, Aline Ramsey of Cape Girardeau; a daughter, Dyan Ramsey of Cape Girardeau; and two sisters, Dorothy Bailey of Alton and Ruth James of Bloomfield, Missouri. Visitation will be from 10 a.m. until service time Tuesday at Morgan Funeral Chapel in Advance. The funeral will be at 11 a.m. Tuesday at the chapel. Burial will be in Bollinger County Memorial Park in Marble Hill, Missouri.